A nightmare for many growers inside the hydroponic industry is the fact that pH adjustments need to be made every now and then to nutrient solutions. In fact, people often adjust the pH of their nutrient solutions several times a week in an effort to keep the values close to those considered ideal. However, most growers are unaware of the basic facts surrounding pH changes and how they can be avoided (please refer to the pH FAQ for more information). The concentration of H3O(+) ions, which are the ions that determinate pH, changes according to other ions present inside the hydroponic solutions. Since plants take ions (which are charged species), outside of the solution, they cause a charge imbalance which is compensated by the generation of either H3O(+) (if the plant absorbs an ion with positive charge) or an OH(-) (if the plant absorbs an ion with negative charge). One of the ways in which this pH change can be effectively controlled is by the addition of a specie which balances out this charge and offers reactivity against either OH(-) or H3O(+) species. Such addition of species to a solution in order to offer a chemical equilibrium protection against pH changes is called "buffering". In hydroponics, solutions are most often "buffered" using ammonia, however, we can carry out simulations to see how this two ions act against "acid" or "base" additions and see how the entire hydroponic system reacts to this. The simulations are carried out using the Maxima software and all the equation systems are generated according to equilibrium equations, mass balance equations and charge balance equations (this is called systematic study of the chemical equilibrium). Concentrations for all the buffering agents were treated as 0.1 mM. Long story short, the graph below shows the results for my simulations of "acid" or "base" additions using three different buffer agents. 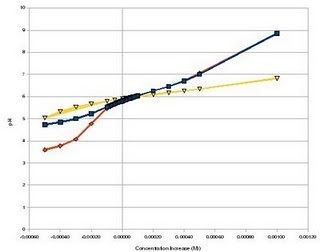 The blue line shows the change when citric acid/citrate is used as a buffering agent, the orange line shows when ammonia is used as a buffering agent and the yellow line shows when carbonate/citric acid is used as a buffering agent. As it can be seen, citrate provides very good buffering capacity towards acid pH values while it's buffering potential towards basic pH values becomes lesser. Ammonia provides almost no buffering potential towards acid pH values while it provides almost the same buffering effect towards basic pH values than citric acid. Note that basic pH buffering seems the same for both buffers because here the effect of the phosphate ions inside the solution becomes more prominent. However, when carbonate/citrtic acid is used as a buffering agent, it suddenly turns the solution's buffering power towards both acid and basic pH values, extremely high. That said, it should be expected for a solution with this buffering mix to last several times more than a regular solution without needing any pH adjustments. In practice, the preparation of this solution has given me at least three weeks of plant intake without any need for pH adjustment. What do you think about adjusting the ph of tap water prior to adding fertilizer. I got tap water with ph of 8 ec of 120 ppm with a carbonat hardness of 5-6. I tried this and lowered my tap to 6.8 with citric then added nutrients and it ended at a ph of 6.4. Then i adjusted my ph to 5.8.After ca 16h it jumped back to 6.5 , so i added some phosphoric and since then it keeps stable.i also noticed some foaming (not really much) in my nutrient solution when im using citric .. why is this happening , should i be concerned about it ? what do u think about adjusting ph to a more acceptable range with tap and citric before adding fertilizer and readusting after another time ?